The Big Dance! I have a projected rank for the top scoring players from each position for the upcoming round to help with your trade targets. As always, discuss your ideas in the comments… I have a feeling this article may generate some discussion! It’s Grand Final time, so there is no looking beyond this week. For that reason, my article is all about the top three point scorers for this round in each position… Probably my biggest ‘balls on the line’ article for the year. The top scorer for the round will predictably be the Pig Tom Rockliff (MID, $625,000). He is in ridiculous form, averaging 141 in his last three and still managed 123 against the Cats despite copping a shoulder knock in quarter two. This week he plays the Saints, who are happy to give up plenty of points and the game is at ES. Not at the GABBA Roy? And you are still backing him? Correct! In his last two games at ES, Rocky has gone ballistic with 179 and 184… (No Typo). In the last game of the season, Rocky will be keen to earn his beers. The Dogs don’t mind giving up points and Merrett and Zaharakis showed that last week. This week it is the young Piglet Lachie Neale’s (MID, $550,000) turn. He has a four game average 124 and has fully embraced being the number one man in the middle for the lowly Dockers. He has three scores over 124 in the last five weeks and is coming off a whopping 169 against the odds at Spotless Stadium against the Giants. Luke Parker (MID, $579,000) will tear the Tigers a new one at the SCG. He is in great form, averaging over 120 for the last five weeks and he has a great ceiling with a top score of 158 for the year. Parks loves playing at the SCG with scores of 128, 116, 111, 158 and 140 there in his last five games. He had a poor score against the Tigers during a form slump earlier in the year before turning it on and he will more than make up for it this games. Click here to subscribe on iTunes. (Our second last for the season). No prizes for guessing young star Zach Merrett (FWD/MID, $584,000) is the number one man here after boasting a three game average of 121 to go with his year average of 118. He has dropped under 100 once in the last 12 weeks and in that time boasts nine scores over 110 to go with two thumping scores of 148 and 150. This week he plays the Blues for a walk-up 130. Nick Riewoldt (FWD, $508,000) is going to feast on the Lions at ES, a ground where he has dominated his opposition all year. It’s a well know fact that opposition talls have been having a field day against the Lion back line and there is no one who has a chance to run with Saint Nick and therefore he will surpass 15 marks to send his season out on a high. A nose behind the Voldt is the in form Leigh Montagna (FWD/MID, $468,000) who has reached triple figures three weeks in a row for an average of 113 in that time. What I like most about Monty is his history against the Lions where he boasts scores of 144, 158, 112, 102, 126, 129 and 133 in his last seven games against them. Kade Simpson (DEF, $492,000) has had an outstanding year, averaging 100 in that time and 107 in his last three games. Earlier in the year he scored 99 on the Bombers, but this time around he is going to go nuts, similar to what we saw from JJ last week. He will be keen to end the year on a positive note against the arch rival and I can’t see him dropping below 125. Jason Johannisen (DEF, $446,000) smashed the Dockers at the start of the year with 35 touches and nine marks and they are about 100 times worse than that now. Heath Shaw had a field day against the Dockers last week and JJ is fresh off the back of a season high 144 from 31 possessions and 12 marks. He will be huge. Sam Docherty (DEF, $508,000) Simmo’s partner in crime the Doc is going to share in the end of year celebrations with a massive send off vs the Bombers. He will be open at will for uncontested marks, not the mention the intercepts he will pick up along the way. A season high could be on the cards, which is a big call for a guy who has reached 140. Brodie Grundy (RUC, $541,000) is averaging a whopping 119 in the last three rounds and expect that high ceiling to continue against the Hawks who are under-manned in the ruck department. He is on an absolute tear with scores of 119, 127 and 139 within his last four games. Max Gawn (RUC, $567,000) It is harsh bumping the big fella down to number two after pumping out 10 triple figure scores in a row and boasting a three game average of 123. It purely comes down to matchups and I think the Demons will get pumped at skilled, keeping Max to around 110 despite scoring 139 down there last year. Can’t lose with these two. Hi i need the fourth best midfielder have the top three. Vince to JJ, and Gray to Hall. Had him all year and has been great recently. Looks good against the suns but he’s the kind of guy that it doesnt really matter who he plays, since he’s an inside tackler/clearance guy. Can only see him going 95-105 this week so I would go elsewhere. Don’t trade out Lewis. He religiously goes ape-sh… against Collingwood. From a bruised Pies supporter. only had 5 players on my field that didn’t ton up last week! hoping for another big one in all of my GFs. Riewoldt will outscore Zorko in the match up game between the saints and lions. BUT, the Neale/Zorko combination should noticeably outscore the Cripps/Riewoldt option. I lost all 3 of my prelims and look set to finish 3k overall for the 3rd straight year! My final trade of the year will mean I never get to upgrade biggs, but he is whipping out some solid 80s anyway. Gutsy, and would loudly cheer the honouring in your team. Alas, I have A Grand Final to contest, and the last time my in the flesh team played a Grand Final with Swanny on the ground, we For rolled the week after a draw … Too painful to revisit, even in an heroic gesture to a player I admire in both the flesh and blood, and fantasy forms of the game … Good luck with your final salute! My tribute to the great, original Pig – I’m trading him in for this last week of the season AND putting the Big C on him. He’s such a star he just might even manage his BE of 204 … with only one foot. Thanks for the good times, Swanny! Sloane to bont,Parker , or cripps? I like Bont or Gibbs? $38k remaining. Forced to trade Sloane this week due to accepting his ban, not too confident on Wells playing this week, could be rested for finals? my original plan was to downgrade Silvagni and upgrade Scully to Dangerfield/ Neale/ any premo, but that’s footy! Any thoughts appreciated. Hunter or Picken? Reiwoldt or Montagna? Firstly, thanks for your comments on my trades. Forced to trade Sloane or move him to the bench … which option will score better this week ? Wills + Boyd (moved Sloane to the bench, moved wills onto the field, and upgraded Biggs to Boyd. how much money do you need for Biggs to Boyd? So forced to trade Sloane as i’m sure many are. Thinking of downgrade to Picken and use the cash to upgrade Collins to Rich in Def with $12k left over. Other option is Sloane to Menegola and Collins to JJ? Sloane to menegola is risky but could pay off for the extra cash to get collins to JJ, do you have Hunter? Rory Sloane + Josh Gibson *rolls eyes* -> Seb Ross & Kade Simpson. St.kilda & Carlton have pretty juicy matchups.. crossing my fingers that Gibson doesnt bite me on the arse with a once in a bluemoon style 130+. I have 7k left. Currently thinking Vince + Naismith -> 100-200k playing rookie who is playing this week + Grundy. Thoughts? Other options are Danger + Naismith -> Menegola + Grundy. WHICH ONE?? Sloane to Hunter or Treloar? Treloar has been on fire recently. Hunter will run second to him, I should know – ran 2nd a few times myself! 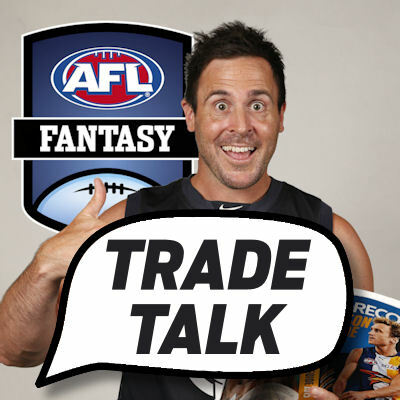 steven and ross could both go huge this week against brisbane… any other plays which u could trade for him? should i go sloane to m.crouch or hunter and with the money left can upgrade clay smith to monty? Roys all talk.. im kicking myself after your so called trade of week forwards 3 weeks ago DAHLHAUS.. never again listen to roy. Dunkleys scoring more.. boo roy. Or do I Pittard to JJ? Will luke hodge score well thia week? Great stuff Roy, thanks for all your help this year. Opponent has both so will score more? Does anyone think that it is worth trading in to Vince in the hope that he gets this score? C.Smith will become Hall leaving $2k. Need to side Sloane to someone up to 525! Lewis/Pendles/Roo?!?!?! who do i get as m8 to complete my midfield? already have rocky, danger, parker, hannerz, neale, titch and hunter. looking at jpk, cripps, bont, treloar or tyson. or someone else? leaning towards jpk. possibly just for the novelty of splashing the cash and having a ridiculous number of swans in my mids rather than any real strategy. cheers, yeah i like me some tackles, think i might just roll with jpk, he should be good!